ACTION PACKED RULES FOR ONE HOUR GAMES! Why not give a try to 1-48TACTIC now ? The rules are available for free in the rules section of the website! 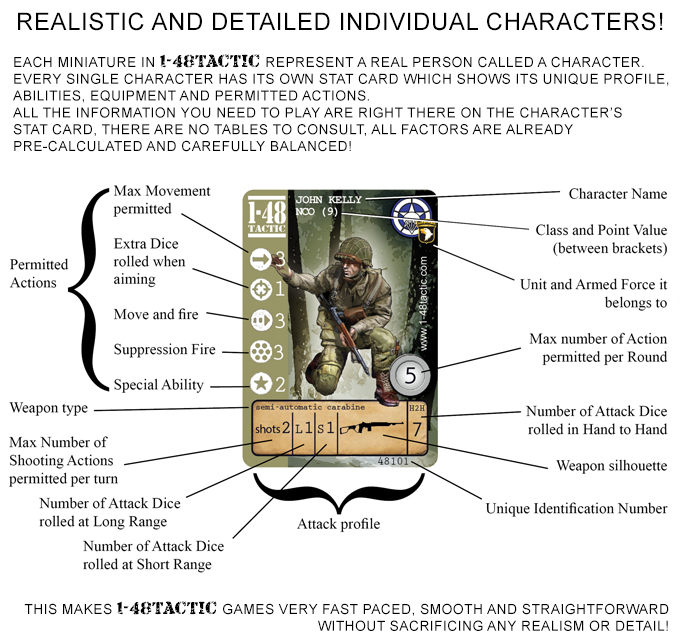 In 1-48TACTIC you command a small force based on a real world army of WWII and attempt to attain victory over your opponents with your superior tactics and a little luck! 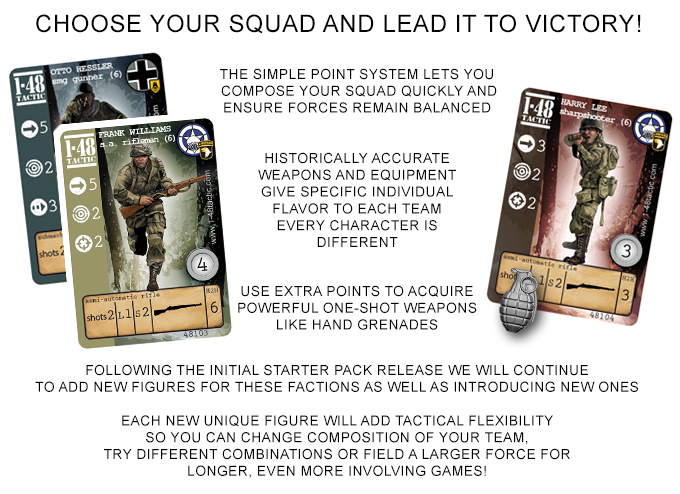 The aim of these rules is to provide the simplest possible set of wargame rules that generate a fast playing cinematic game and which gives an involving, passionate and satisfying experience, but also respects real battlefield tactics simulated with intuitive and realistic mechanics. 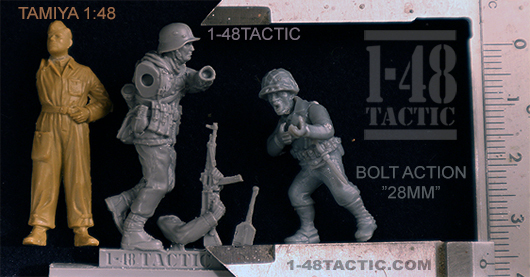 The focus is on small scale action, typically from a section (4-5 figures) to a whole infantry platoon per side. 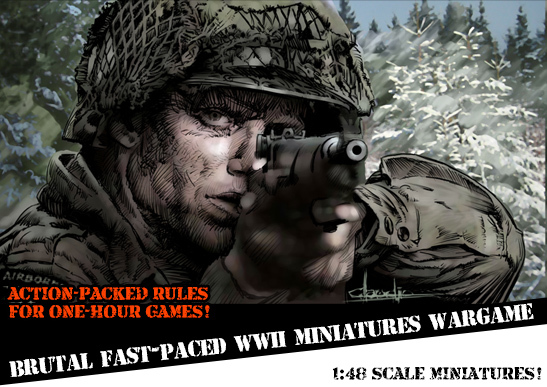 The whole game can be scaled up or down at will without bogging down thanks to 1-48TACTIC robust engine and unique command and control system The gameplay is fast, brutal, involving, passionate and satisfying, and can be experienced at its fullest already with as few as four miniatures for each player! 1-48TACTIC is played on a board as small as 60x60 cm (2'x2') or as much larger as you like. The game is generally played by two people, each in command of a single armed force, called a "playable faction" within the game. A player force don't need to be limited to a single squad however, and three or four players games can be lot of fun! 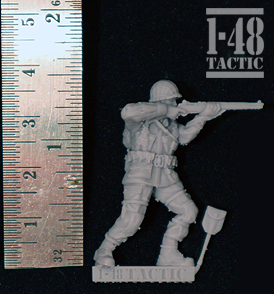 What 1-48 means and how big are the miniatures? 1:48 is an exact scale, it means that the scaled models are 48 times smaller than the actual size of the real object. It is sometimes referred to as quarter scale because a quarter inch represents one foot and is equivalent to the model trains 0 scale in USA (note that in the UK 0 Scale is more commonly 1/43.5 or 7mm to the foot and in the rest of Europe 0 Scale is 1:45 !). Tamiya and other scale model makers offer a wide selection of military vehicle models and figures in this scale and there is a growing number of ready to play die cast models available from many manufacturers. 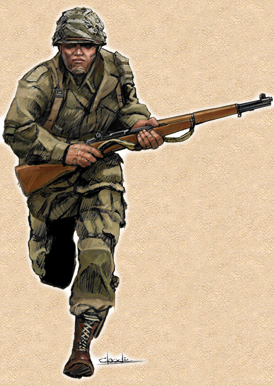 An average standing man in 1:48 scale is approximately 36mm tall, 1-48TACTIC figures are therefore fairly close in size to the commonly called 32mm (when measured to the eyes) or "heroic scale" wargame figures, but are more realistically proportioned.